TWIC Spring Conference 2019 - Fully Booked! 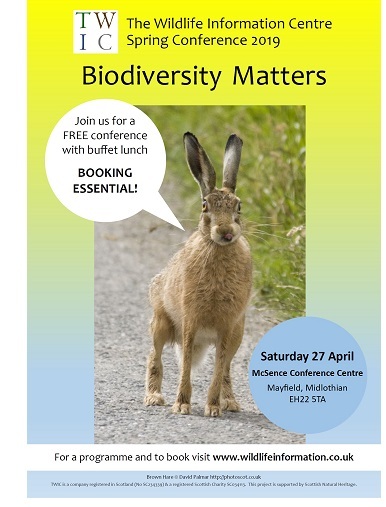 Bookings are now being taken for the TWIC Spring Conference: Biodiversity Matters, which will take place on Saturday 27 April at the McSence Conference Centre in Mayfield (Midlothian). This time our programme is centred around key themes in the new Midlothian Local Biodiversity Action Plan, such as pollinators, people and nature, wildlife corridors, homes for wildlife and protected sites. However, the talks will not necessarily be geographically specific to Midlothian. Posted by Natalie Harmsworth, 15 February 2019 and updated 22 April 2019. 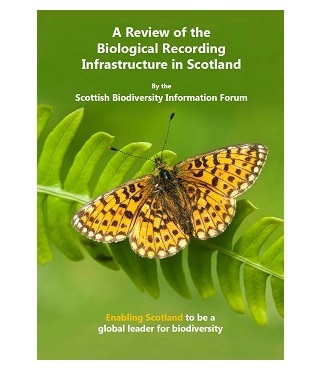 The Scottish Biodiversity Information Forum (SBIF) Review has now been published and makes 24 recommendations that will hopefully improve the biological recording infrastructure in Scotland. To learn more about the recommendations and the next steps in the process please visit the SBIF page. Posted by Natalie Harmsworth, 18 December 2018. Recorder 6, the venerable database program that underpins the work of almost every Local Records Centre in the UK, is about to regain much of its lost support. Formerly Recorder 6 was supported by JNCC funding, but this ended in March 2018. An extra year's funding was secured from an anonymous source, but the future of the program was looking very uncertain. Now though, a Recorder 6 Steering Group is to be formed from various Recorder 6 users. The group aims to not only keep Recorder 6 going as a viable platform, but to look to the future and look at developing a new platform using the data structures we’ve all come to rely on. Additionally, the group is planning to introduce licence fees for Recorder 6. Under the new plan, from April 2019 onwards, each Recorder 6 user will pay an annual fee based on what type of user they are (£250 for an organisation or £25 for an individual). This will allow for not just maintenance and bug fixes to the program, but also potentially new features. The National Biodiversity Network (NBN) Trust will also be working with the group in a management capacity. Other plans include training new developers for Recorder 6 and to work on new ways for users to obtain support for Recorder. More information can be found on the NBN Forum. Posted by Natalie Harmsworth, 18 December 2018. Edited 20 December 2018. The speakers' presentations can now be downloaded as PDFs via our Previous conference page. In addition to the main talks, four quick-fire talks were included in the programme, giving attendees the opportunity to promote their respective projects or organisations. The speakers were: Roger Manning (Berwickshire Naturalists Club), Vladimir Krivtsov (Biodiversity of SUDS retention ponds), Graeme Wilson (Lothians and Borders Mammal Group) and Katty Baird (Hibernating Heralds). The TWIC conference is all about sharing knowledge and celebrating the work of the many, mainly voluntary recorders across the region. In order to formally recognise the work of individuals, TWIC annually awards the Bob Saville award at our autumn conference to someone who has made an extra ordinary contribution to biological recording and conservation in our area. This year, the award was given to Barry Prater (pictured), in acknowledgement of all the recording effort and support Barry has given to the lepidopterist community over many years. Barry is Berwickshire vice-county moth recorder, Scottish Borders area organiser for Butterfly Conservation and former chair of the East Scotland Branch of Butterfly Conservation. He has submitted over 15,000 of his own records to TWIC and is an active member of the Scottish Borders Local Biodiversity Sites steering group, the group that oversees the selection, survey and approval of regionally important sites for nature conservation. TWIC would like to thank all the speakers for their excellent talks, Michael Scott (Live Borders) for chairing the morning session, the stall holders and open mike speakers for their contributions and everyone who attended. The spring 2019 conference is planned for Saturday 27 April in Midlothian. PLEASE SAVE THE DATE! Photos from the autumn conference can be viewed on our Facebook album (no login required). Editor comment: Current users of the Tom.bio QGIS Plugin may be interested to know there is a consultation on its future development and features at the moment. Please follow this link to complete a 10 minute questionnaire if you would like to provide feedback to Field Studies Council on the tool. Posted by Natalie Harmsworth, 5 December 2018. Edited 20 December 2018. TWIC Autumn Conference - Book now! 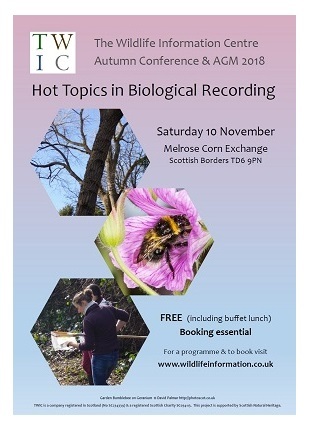 Bookings are now being taken for the TWIC Autumn Conference & AGM, which will take place on Saturday 10 November 2018 in Melrose, Scottish Borders. Further details, including a programme of talks can be found on our Conferences page. We have aimed for a varied programme talks around the theme “Hot topics in biological recording”. The event will also include the presentation of the Bob Saville award for biological recording and participants will have the opportunity to promote their own survey or recording initiative during the open mike session (please register for a slot on the booking page). The event is FREE to attend and includes buffet lunch, but BOOKING IS ESSENTIAL for catering purposes. Bookings are being taken via Eventbrite. Please book by midday, Monday 5 November. Posted by Natalie Harmsworth, 25 October 2018. Updated 13 November 2018. 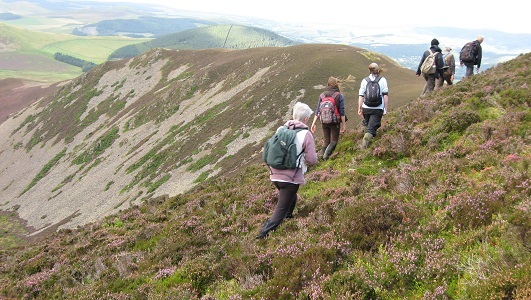 Scottish Borders Council is consulting on their new Local Biodiversity Action Plan (LBAP) 2018 - 2028. Visit: www.scotborders.gov.uk/lbap to download the draft plan. Hard copies of the plan are available in each of Scottish Borders Council’s libraries and contact centres. Comments on the plan should be submitted at http://scotborders.citizenspace.com by 30 November 2018 at the latest. Posted by Natalie Harmsworth, 4 October 2018. Photograph of gynandromorph Orange tip butterfly by Nick Morgan. 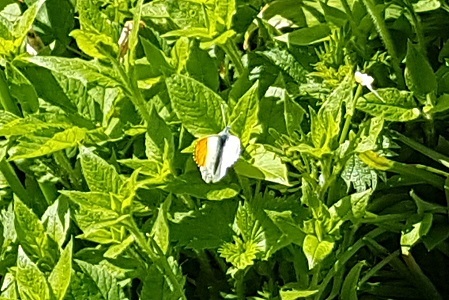 Local recorder, Nick Morgan spotted this Orange Tip butterfly on 27th April along the River Tyne near Haddington, East Lothian whilst out doing his butterfly transect. He noticed the butterfly had a wonky flight, but on closer examination he realised the wings didn’t match! There is the “orange tip” of the male on the left wing, and the plain white of the female on the right wing. What’s going on? 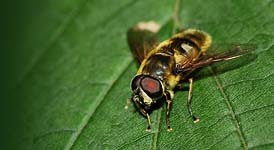 It’s a gynandromorph – a mixture of both male and female. More details no doubt to be had on Google, but according to experts it is “a find of a lifetime”. Well done Nick. Article adapted from June 2018 issue of Best boot forward - Newsletter for East Lothian Countryside Volunteers. Postscript: Nick tells us that the butterfly was seen twice more following this sighting, but not by him. It was seen the following day about 300 metres downstream from the initial sighting and also the following week about 500 metres along a tributary of the Tyne! Posted by Natalie Harmsworth, 21 June 2018. Spring Conference - A Soaring Success! Overall, we enjoyed an excellent day exploring different aspects of upland recording and conservation. Thanks to the speakers for their engaging and high quality talks, the open mike speakers for their individual contributions and to everyone who attended or brought a display. The event would be nothing without you the recorders and supporters! If you want to know what you missed, or would like to recall something from the day, the speakers’ presentations are now available to download from our website as PDFs on the Previous Conferences page. You can also view photos from the event in our Facebook album (Facebook account not required). The TWIC team are now thinking ahead to the autumn 2018 event – details of which will be forthcoming. To keep up to date with news of future TWIC conferences, please opt-in to our mailing list for “TWIC Events and Conferences” by emailing natalie@wildlifeinformation.co.uk. Due to the General Data Protection Regulations that came into force on 25 May, we need your explicit consent to include you on our mailing lists – so please make sure you do not miss out! 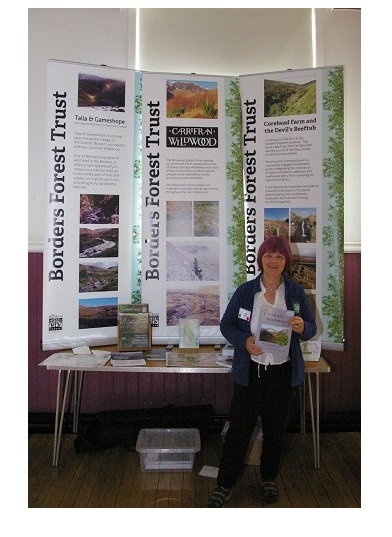 Photograph: Sarah Eno (Borders Forest Trust Trustee) standing by her stall at the spring conference. Photo by Samra Asrat. Posted by Natalie Harmsworth, 25 May 2018. 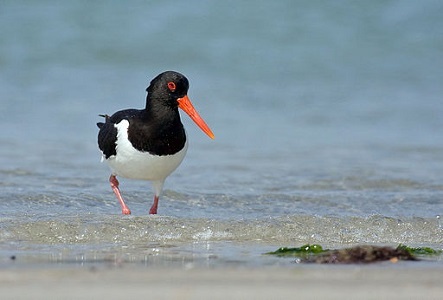 Oystercatcher photo by Andreas Trepte www.photo-natur.net [CC BY-SA 2.5 (https://creativecommons.org/licenses/by-sa/2.5)], from Wikimedia Commons. On Thursday 26 April 2018, our Recorder 6 database passed the milestone of holding more than 2.5 million species records – so a huge thank you goes to all the recorders and organisations who share their data with TWIC. Their continued efforts are fundamental to TWIC’s role in providing high quality, objective and independent wildlife information. The 2,500,000th record, submitted by Graham Checkley, was for an Oystercatcher Haematopus ostralegus, and was uploaded by our long-term volunteer Lesley Kennedy whose cheerful dedication is an immense help to TWIC. To find out more about how you could help TWIC, visit our Recording or Volunteering pages. By Jackie Stewart. Posted by Natalie Harmsworth, 24 May 2018. Bookings now open for TWIC Spring Conference! Location: Sauchie Hall, Mar Place, Sauchie, FK10 3EA. Details: TWIC's Spring Conference is an opportunity for naturalists across the region to get together at the start of the recording season to exchange news and ideas, and to listen to a series of talks on the theme of upland recording and conservation. There will be an opportunity for individuals or local groups to promote their recording initiative or project during the open mike session, by having a stall, or presenting a poster. The conference is FREE to attend, and will include a buffet lunch, but booking is essential. Booking details: To view the programme and to book, please visit Eventbrite. Posted by Natalie Harmsworth, March 22nd 2018. Details: Join local recorder Katty Baird for an introduction to these fascinating creatures and a chance to observe them in the field. No previous experience necessary. This workshop will be partly field based. Please bring suitable outdoor clothing and lunch. Teas/ coffees will be provided. Cost: Places are FREE but limited, so booking is essential. To book, please visit Eventbrite. Posted by Natalie Harmsworth, March 14th 2018. This is your chance to win a bat walk for yourself and up to 24 family and friends at a location on mainland Scotland at a place and date to be agreed between May to September 2018. The walk will be led by TWIC Manager Graeme and will include a talk on bats before being led on a walk to see bats, as well as hear them with the use of bat detectors. The combined talk and walk will last at least an hour and a half. To be in with a chance of winning this prize all you need to do is donate £10 to The Wildlife Information Centre using details below and send an email to batwalk@wildlifeinformation.co.uk confirming you have made a donation and with your contact details. If you make a donation of £20 then your name will be entered twice into the draw, £30 donation three entries, etc. Minimum donation is £10. Contact details you supply will only be used to contact you regarding this competition. The competition is open until 31st March 2018 with the winner being drawn in the first week of April. The winner's name will appear on TWIC's website and in our social media. 1. Competition not open to TWIC Staff and Board members or members of their direct family. 2. Location of bat walk must be on land with public access or where permission for walk has been granted. 3. Date of bat walk will be by mutual agreement between TWIC Manager and winner. If weather is unsuitable for bats on agreed date then walk will be rearranged for a later date. Bookings Now Open for TWIC Autumn Conference & AGM! Details: The TWIC Autumn Conference will provide an opportunity for all those interested in wildlife recording and conservation across the region to join together at the end of the season. Talks will showcase a number of recording initiatives and citizen science studies in southern and central Scotland that are furthering our knowledge of wildlife and sometimes using novel approaches in pursuit of their target organism! The event will also host TWIC's AGM and the presentation of the Bob Saville Award. Download the programme here [PDF, 93.4 KB; updated 01/11/17] and the flyer here [PDF, 3.41 MB]. Cost: FREE, including buffet lunch, but booking is essential as numbers will be limited. To book, please visit Eventbrite. Note that there will be a raffle and other items to purchase, so please bring cash if you are interested in these. Getting there: Stow is situated on the Borders railway line. The train station is a short walk from the venue. A link to the timetable is below. Note not all trains stop in Stow: Scotrail train times. Stow is also served by the X95 bus. For a route map and timetable click here. There is free on-street parking adjacent to the venue. The search for spiders continues. This month the spotlight is on the Four-spotted Orbweb spider. An impressive species which according to TWIC records has only been seen in a sprinkling of locations across SE Scotland, including coastal sites such as Aberlady and John Muir Country Park but also inland at places like Red Moss of Balerno... Where else might it be lurking? The Four-spotted Orbweb spider is most obvious at this time of year when the large adults are about. They can be found in areas with vegetation tall and strong enough to support their web, which can be up to 40 cm in diameter. The web is rarely higher than 1.5 m from the ground so undisturbed rank grassland, areas with gorse or heather, marram dunes are good places to look. The key feature to distinguish this spider from other superficially similar species are the four white spots on the back of the abdomen. The colouring of the spider can be quite variable, ranging from greens to yellow to orange. Their colour can change and is possibly related to humidity (in damper places they tend to be paler and greener whist in drier areas they are more orange). Egg-laden females are big; in fact this species is has the accolade of Britain’s heaviest spider, with records of 2 g not unusual. If you see one send your record into the Scottish Spider Search! 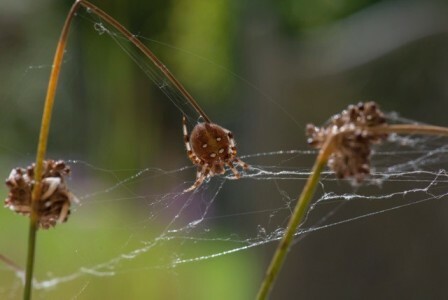 More fascinating information about this spider can be found on the British Arachnological Society's website. Katty Baird. Edited by Natalie Harmsworth. Posted by Natalie Harmsworth, September 14th 2017. Scottish Borders Butterfly recorder, Iain Cowe recently spotted a White Letter Hairstreak butterfly (Satyrium w-album) in Scotland for the first time in recent history. The butterfly was discovered on 9th August 2017 near Paxton House in Berwickshire close the border with England. 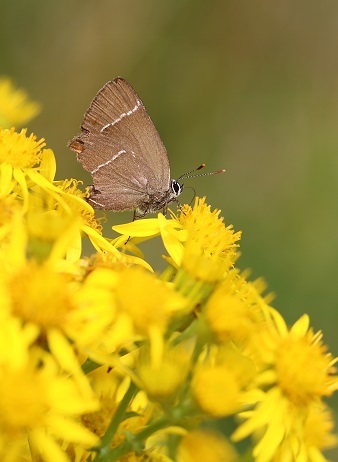 The butterfly was found nectaring at Ragwort on a south facing field margin on the north side of the Tweed. There are only two previous records of White Letter Hairstreak in Scotland, one in 1859 (Lennon) Dumfries, and another in 1884 at Sandbank, Dunoon (William Watson) (George Thomson, The Butterflies of Scotland). Since then virtually nothing is known about the butterfly and its status in Scotland. Butterfly recorders have thought for some time that this species may appear in the south of Scotland, as it has increased its range northwards in recent years, probably in response to climate change. The butterfly flight period is likely to be July through to mid-August, although there is much yet to learn about its habits this far north. The food plant is Elm and the butterfly spends a lot of its time in the canopy but will descend to nectar at Bramble flowers and evidently Ragwort. South facing wooded banks containing Elm with an understory of Bramble would be a good place to start looking. In North Northumberland the butterfly is pretty much unknown, apart from, that is, occasional sightings in the far south of the region but now it looks extremely likely that it resides throughout the region as far as the Border and beyond. It’s incredibly difficult to locate along with its cousin the Purple Hairstreak that favours Oak instead of Elm. For more information on the species, visit Butterfly Conservation’s website. Posted by Steve Hannah, August 17th 2017. White Letter Hairstreak. Photograph: Iain Cowe. Make your wildlife observations count! A practical 1 day workshop from The Wildlife Information Centre (TWIC) including an outdoor ID session. No experience necessary. Bring suitable outdoor clothing and packed lunch. FREE, but booking essential. Ages 16+. To book please go to the Live Borders website. Posted by Natalie Harmsworth, July 25th 2017. Thanks to the many recorders and organisations sharing their records with TWIC, our database now holds more than 2.3 million records – proof that “Mony a mickle maks a muckle”. 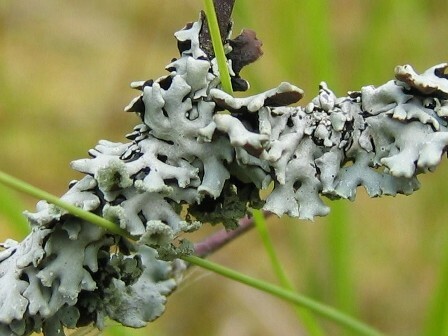 The 2,300,000th record was for Hypogymnia physodes, a foliose lichen, entered as part of the British Lichen Society’s Lichen Database: Scotland 1700-2016. 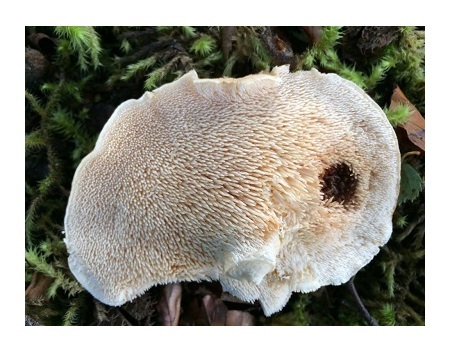 For more information on the work of the British Lichen Society (BLS), visit their website, www.britishlichensociety.org.uk. 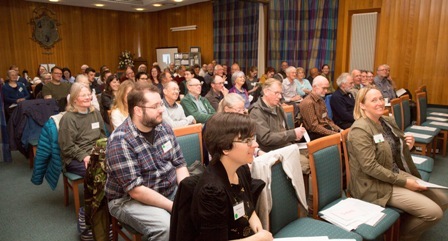 The audience assembled in the Brunton Hall, Musselburgh for the talks. Photograph: David Palmar. The TWIC Spring Conference was held on Saturday 29th April 2017 at the Brunton Hall in Musselburgh and was attended by 70 people. The topic was 'Farming and Biodiversity in Scotland - An Essential Partnership' and talks on this theme were delivered by Dr Tim Daniell (University of Sheffield/ The James Hutton Institute), Luke Gaskell (Kittyfield Farm and Botanical Society of Britain & Ireland recorder), Fiona Torrance (The Game and Wildlife Conservation Trust), Teyl de Bordes (Whitmuir Farm, near Selkirk) and Dr John Kerr (Science and Advice for Scottish Agriculture). Two further update talks were given by Pete Minting (Amphibian and Reptile Conservation Trust) and Katty Baird (Butterfly Conservation National Moth Recording Scheme). We were grateful to all the speakers for their engaging and thought-provoking presentations - but special thanks go to Katty Baird in particular for stepping in at very short notice. TWIC’s Autumn Conference is scheduled for Saturday 25 November 2017 with a venue in the Scottish Borders to be confirmed - please put the date in your diary! Read the full report here [PDF opens in new window, 7 pages, 2.23 MB]. Details: For all who want to learn small mammal ID and mammal surveying skills. Day will involve checking Longworth traps for live captures and hedgehog tunnels for foot prints as well as a classroom session on owl pellet dissection focusing on small mammal skull and lower jaw ID and a bit of time looking at technology to record mammal presence via both video and sound recording. Requirements: Bring a packed lunch and wear appropriate clothing and sturdy footwear for outdoor session. Cost: The workshop is FREE but booking is essential as numbers will be limited. To book, please visit Eventbrite. Details: David Dodds will be leading an evening workshop on identifying bats in the field using a heterodyne bat detector. 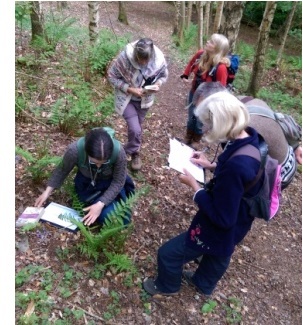 There will be an indoor classroom session covering the theory followed by a bat walk in the environs of Harestanes to get hands-on assistance using detectors in the field. Tea/ coffee will be provided on arrival. Please wear stout footwear and warm clothes. 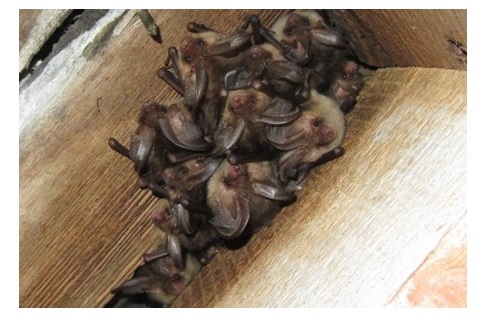 Bat detectors will be available to borrow, but if you have your own please bring it along. 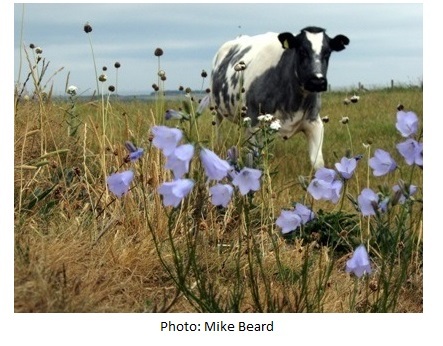 This is a joint event with the Lothians and Borders Mammal Group (LABMAG) and Live Borders. Cost: The workshop is FREE but booking is essential as numbers will be limited. To book, please visit Eventbrite. Note that the workshop is now FULLY BOOKED. However, if you would like to be added to the waiting please register on our Eventbrite page. RSPB’s Mike Fraser will be leading a morning chorus workshop for TWIC on Saturday 3 June from 5 am to 8 am at Hadfast Valley SWT reserve in Midlothian. 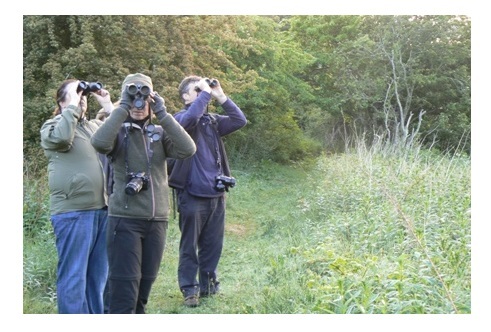 The workshop will provide an introduction to identifying birds by sight and sound. No previous experience necessary. The workshop is FREE but booking is essential as places are limited. To book a place please send a completed booking form to natalie@wildlifeinformation.co.uk. Participants should bring suitable outdoor clothing, binoculars, a drink and a snack. 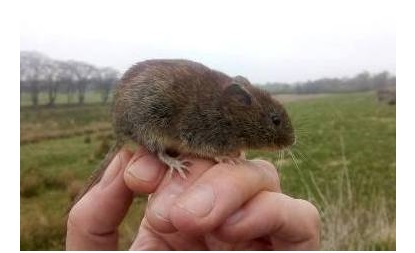 Details: Talks will highlight the diversity of wildlife found on farmland - from soil organisms through to wildflowers, birds and mammals - and how this interest can be managed. There will also be two talks from previous speakers to update us on their projects. Download the programme here [PDF, 80.9 KB] and the flyer here [PDF, 2.97 MB]. Cost: FREE, including buffet lunch, but booking is essential as numbers will be limited. To book, please visit Eventbrite. Getting there: For information on how to find the venue, including public transport options please visit The Brunton website. With thanks to Caledonian Conservation Ltd. for sponsoring lunch. The TWIC AGM that is to take place on Wednesday 1 March in The George Washington Browne Room Edinburgh Central Library at 6.30pm is followed by a talk by Enya O'Reilly of Edinburgh Napier University on "The many uses of biological records: analysis of long-term trends in East Lothian's birds using Wetland Bird Survey data". Non-members welcome and can also take opportunity to become members if they wish, cost £5. Please arrive in plenty of time as we will be starting at 6.30pm prompt. 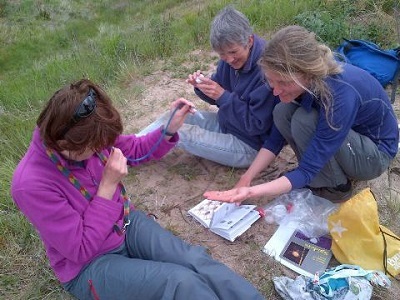 A volunteer is required to support TWIC’s new wildlife survey, the Scottish Spider Search – a project supported by the British Arachnological Society, Buglife and Caledonian Conservation Ltd. and part funded by Scottish Natural Heritage (SNH). The volunteer will be responsible for organising the distribution of survey postcards, processing data and publicising the survey online. We are looking for a volunteer to commit a minimum of 1 day per week, ideally for 6 months (we can be flexible with length of time). Applicants must have an organised approach to work, be a competent user of Microsoft office packages especially Excel and have the ability to work well as part of a small team. An ecology-related degree or equivalent experience would be an advantage, but training will be provided. CVs should be sent to Natalie Harmsworth, Records Ecologist, natalie@wildlifeinformation.co.uk or phone 01875 825968 for a chat. Applications should be received no later than March 31st. A volunteer is required to support TWIC’s Phase 1 Habitat digitisation project. 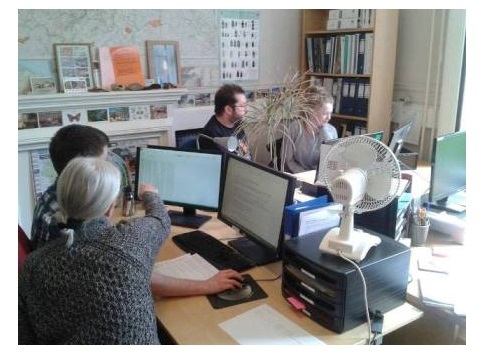 The volunteer will be responsible for the digitisation of habitat data and the extraction of species data from Scottish Wildlife Trust's Local Wildlife Site survey files in Stirling, Clackmannanshire and Falkirk areas. We are looking for a volunteer to commit a minimum of 1 day per week. Applicants must have experience of using GIS software (preferably ArcGIS) and the ability to work well as part of a small team. An ecology-related degree or equivalent experience would be an advantage, but training will be provided. CVs should be sent to Steve Hannah, GIS and Data Officer, steve@wildlifeinformation.co.uk or phone 01875 825968 for a chat. 2016 recipients of the Bob Saville Award: Brian & Sandy Coppins. Photo: Natalie Harmsworth. 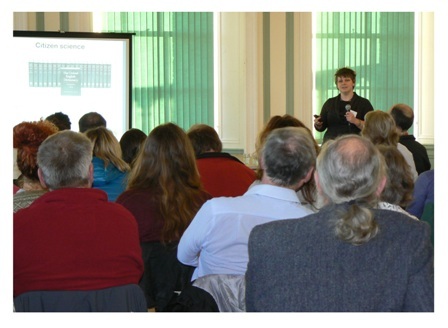 The Autumn Conference was held on Saturday 26th November 2016 at Bo’ness Town Hall and was attended by 61 people. The programme of talks focussed on the marine theme – from examples of citizen science and recording initiatives to more applied aspects of ecology – with a brief detour to launch the Scottish Spider Search before lunch! The calibre of speakers was very high and they provided both interesting and entertaining talks. 2016 marked 25 years since the inception of TWIC's predecessor organisation “Wildlife Insite” in 1991 and TWIC Manager, Graeme Wilson, provided a potted history of TWIC during his talk. 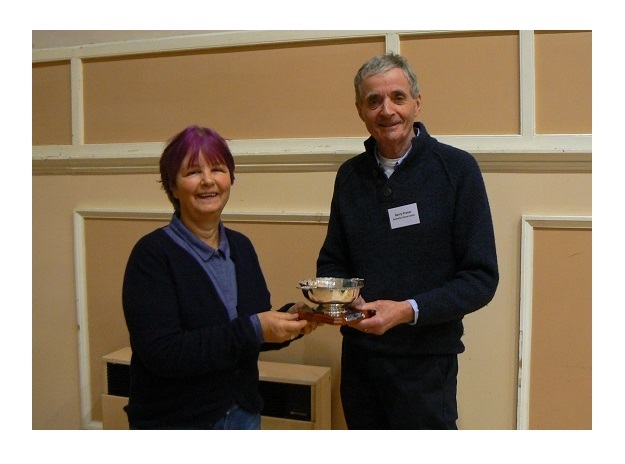 Another highlight of the day was the presentation of the Bob Saville award, which this year was awarded to Brian and Sandy Coppins (pictured) for their huge contribution to the recording of lichens in Scotland and their generosity in giving their time in supporting and educating new lichenologists. A full conference report can be downloaded from here. Posted: January 25th 2017. Updated February 28th 2017. 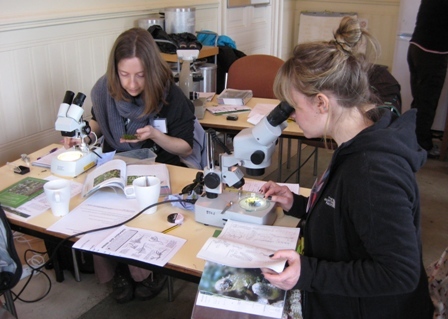 BRISC (Biological Recording in Scotland) and GNHS (Glasgow Natural History Society) are together offering 6 bursaries towards attending a training course in natural history field studies. The bursaries will be for up to £200 or 75% of the cost of the course, whichever is lowest. Bursaries are open to anyone living in Scotland. Courses must be chosen from the taxonomic courses listed under the Field Studies Council (FSC) Professional Development Programmes (see www.field-studies-council.org) or similar professional development courses run by academic institutions. Please note that NVC courses are not eligible for the bursary. Courses should be completed before 31 October 2017. BRISC and GNHS are keen to ensure that any biological records gathered are mobilised to the Atlas of Living Scotland or NBN Gateway, through local record centres, local data hubs or online recording schemes depending on what is available. We are also keen to encourage the sharing of skills with colleagues and others. We are particularly interested in applications for courses where the species/group has a lack of taxonomic expertise, and/or geographic areas where records are limited. The successful candidates are required to write a short article (300-400 words) on their course experience for BRISC Recorder News and/or the GNHS Newsletter. £30 of each bursary will be held back until receipt of the relevant article. Successful candidates will be given a year’s free membership with BRISC and/or GNHS, and will be invited to give a short presentation at the annual BRISC Conference. Download the application form here (Word document, 2 pages, 67 KB). Students studying bryophytes. Photo courtesy of Mike Beard.